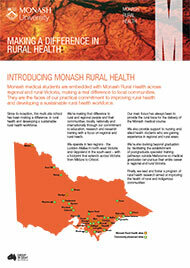 Monash Rural Health is a multi-site school within the Faculty of Medicine, Nursing and Health Sciences. The school is committed to improving rural health and developing a sustainable rural health workforce. It seeks to make a difference to rural people and their communities, locally, nationally and internationally through its commitment to excellence in education and research. Our footprint extends across Victoria from Mildura in the west to Bairnsdale in the east. 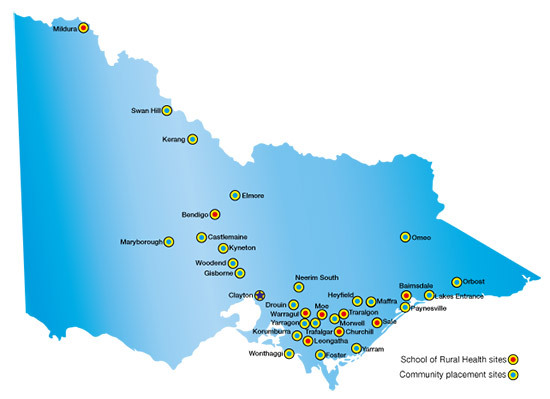 It operates through two distinct hubs: one in the Loddon Mallee Region in north-west Victoria and one in the Gippsland region in south-east Victoria. develop innovative interprofessional education and health service models. Read more about the school in our introductory brochure. (PDF 1.7MB).